James led the Pueblo High School baseball program from 1956 to 1975 and also officiated high school football in Arizona for more than 25 years. According to an article in the Arizona Daily Star in the 1950s, James was the first “American Indian hired for a teaching position in Arizona.” Attending school as a youngster and raised in the Mesa Grande Indian Reservation in Southern California, James had an affinity for low-income students while he was a coach and teacher in Tucson. He helped many youngsters obtain health care, financial aid for college and supported and encouraged them to achieve. James attended UCLA and USC, where he received a bachelor’s degree and a master’s in education. James also was an active handball player, winning many tournaments and championships at the YMCA/Tucson Athletic Club. He was also an accomplished golfer and won the Tucson Golf League Championship in 1980. He also played baseball while serving with the U.S. Army from 1942 to 1945. Before and after his Army tour, James played professional baseball with teams in Tucson, El Centro, Albuquerque, Vancouver and Yakima. While coaching baseball at Pueblo in 1963, James was part of a 16-member staff that toured Latin America teaching baseball as a goodwill gesture through the U.S. Department of State. 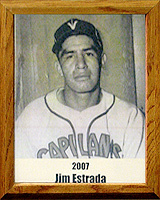 James Estrada passed away in 2000.